Speaker Rental - Sound solutions for any size event. We carry a large inventory of premium powered speakers, all of them packed with useful features including multiple inputs, built-in processing such as bass or vocal boost, a limiter to protect the amplifier from overload, and low power consumption so they can be connected to any standard AC outlet. Most importantly, our speaker packages sound amazing! Check out our Speaker Rental Packages page to see the range of available packages, which include stands, cabling, and everything you need to get started. 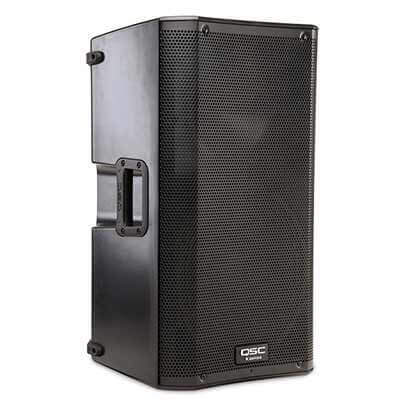 Whether you need a simple speaker setup for wedding announcements, something sleek and low profile for a cocktail hour or corporate event, or a 10,000 watt line array setup for a live band or DJ, we've got solutions to fit your needs and your budget. We offer delivery, setup, and on-site technical services including sound engineering, mixing, and stage management. Have questions? Give us a call @ 1.888.826.1299 or email us and we're happy to make recommendations - we can help you choose the right speakers for your event. We offer assistance in fulfilling Technical Riders, so feel free to send over your DJ, band, or artist's requests. One of our most popular and versatile packages, the Wi-Mic and Music Package is up to any number of challenges--from small corporate conferences to wedding season and church services. Package includes speakers and stands, mixer, wireless microphone and iPod / laptop cable.The QSC K12s provide sound for rooms of up to 150 people.